They've zoomed in on it, it's blurry. I think everyone should wait for everything to transpire before we speculate on whether a husband and father deserved to die. If you point a gun you will get shot. But we don't know yet. Time will tell though, they'll be forced to release their footage. Well, what we have here is . . . nothing. Does not film her husband at all, or the gunshots. It is still her word vs. theirs. She did nothing to deescalate the situation save for cause a distraction to the cops. All I see here is an angry woman who don't like cops and don't trust her husband. Yup, when the police video is released, maybe then we'll see something. Until then, we still have nothing to go on. I wonder if anyone noticed her saying "Keith don't do it" several times? 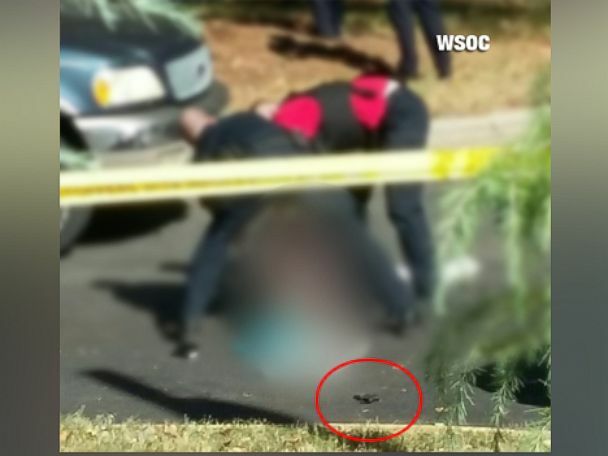 Cellphone video shows the encounter between police and Keith Lamont Scott !! Apparently this is from Scott's wife. Well what does this show now? "He better not be f---ing dead, he better not be f---ing dead," Rakeyia Scott can be heard shouting at the police officers. "He better live, he better live!" It is not clear what preceded the shooting. Interesting...so she is screaming for her husband "Keith don't do it" What is she telling him not to do? And the report you link to says there is no gun visible. I can see it on the ground right next to Keith as he is laying there...one officer appears to even kick it out of the reach of Keith's body at one point as well. The officer gave him VERY clear instruction to drop the gun multiple times and he didn't. Did you see who threw the gun down there? Not saying he didnt have a gun but the cops ver well could have dropped the gun there. After all the cop in tulsa said the guy was reaching in his car for a gun. Obviously a lie. Cops lie like anyone else. They certainly are not beyond having throw down weapons incase they mess up. Or drugs for that matter. Like this guy who was caught planting a gun on a guy he killed. To which she replies, "He doesn't have a gun he has an (inhaler), he just took his medication." That gun isn't there in the video! I also noticed what you said. What was also a red flag for me was how she pointed the camera down when the incident was taking place. She was aimed on them when she was yelling about how they were going to break the window out. Guess she didn't want something shown once he got out of the vehicle. IMHO. I saw the "object" get tossed as well. I had seen the photo in this thread yesterday and I was looking for the gun in the video, I do not see it. This could be really big trouble for the officers involved. I didnt see it either.